It must be justified, true and believed. " I think i'm to Thick to grasp the difference between 'Justification' and 'Believe', thinking that to be able to say that "I Believe This" is based upon the ability to Justify 'This'. 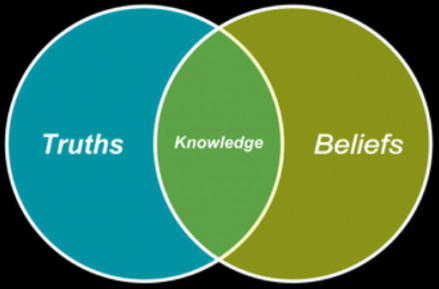 The 'Knowledge' that will be 'Distilled' from the 'Truth', Depends on the 'Beliefs' of the Searcher! But there are also Unknown Unknowns; the ones we Don't Know we Don't Know." Or could it even be these statements are Both true? Maybe these Unknown Knowns is what used to be called 'Wisdom'? There is that that is 'known'. There is more that has 'not yet been proven', and/or is 'Controversial'. There is an even bigger bit that is 'provable, but no-one has thought of it yet'. An even bigger bite consists of what is imaginable but what is un-testable.